German submarine U-977 was a World War II Type VIIC U-boat of Nazi Germany's Kriegsmarine which escaped to Argentina after Germany's surrender. The submarine's voyage to Argentina led to many legends, apocryphal stories and conspiracy theories that together with U-530 it had transported escaping Nazi leaders (including Adolf Hitler himself) and/or Nazi gold to South America, that it had made a 66-day passage without surfacing, that it had made a secret voyage to Antarctica, or even that it would be involved in the sinking of Brazilian cruiser Bahia as the last act of the Battle of the Atlantic. German Type VIIC submarines were preceded by the shorter Type VIIB submarines. U-977 had a displacement of 769 tonnes (757 long tons) when at the surface and 871 tonnes (857 long tons) while submerged. She had a total length of 67.10 m (220 ft 2 in), a pressure hull length of 50.50 m (165 ft 8 in), a beam of 6.20 m (20 ft 4 in), a height of 9.60 m (31 ft 6 in), and a draught of 4.74 m (15 ft 7 in). The submarine was powered by two Germaniawerft F46 four-stroke, six-cylinder supercharged diesel engines producing a total of 2,800 to 3,200 metric horsepower (2,060 to 2,350 kW; 2,760 to 3,160 shp) for use while surfaced, two Brown, Boveri & Cie GG UB 720/8 double-acting electric motors producing a total of 750 metric horsepower (550 kW; 740 shp) for use while submerged. She had two shafts and two 1.23 m (4 ft) propellers. The boat was capable of operating at depths of up to 230 metres (750 ft). The submarine had a maximum surface speed of 17.7 knots (32.8 km/h; 20.4 mph) and a maximum submerged speed of 7.6 knots (14.1 km/h; 8.7 mph). When submerged, the boat could operate for 80 nautical miles (150 km; 92 mi) at 4 knots (7.4 km/h; 4.6 mph); when surfaced, she could travel 8,500 nautical miles (15,700 km; 9,800 mi) at 10 knots (19 km/h; 12 mph). U-977 was fitted with five 53.3 cm (21 in) torpedo tubes (four fitted at the bow and one at the stern), fourteen torpedoes, one 8.8 cm (3.46 in) SK C/35 naval gun, 220 rounds, and one twin 2 cm (0.79 in) C/30 anti-aircraft gun. The boat had a complement of between forty-four and sixty men. U-977 was mounted with a single 3.7 cm Flakzwilling M42U gun on the rare LM 43U mount. The LM 43U mount was the final design of mount used on U-boats and is only known to be installed on few U-boats (U-249, U-826, U-1023, U-1171, U-1305 and U-1306). The 3.7 cm Flak M42U was the marine version of the 3.7 cm Flak, used by the Kriegsmarine on Type VII and Type IX U-boats. The single 3.7 cm Flak M42U gun on the LM 43U mount. U-977 was launched in March 1943. She was used in training and made no war patrols during her first two years of service. On 2 May 1945 she was sent on her first war patrol, sailing from Kristiansand, Norway, commanded by Oberleutnant zur See Heinz Schäffer (1921–1979). Schäffer's orders were to enter the British port of Southampton and sink any shipping there. This would have been a very dangerous assignment for a Type VII boat. When Admiral Dönitz ordered all attack submarines to stand down on 5 May 1945, U-977 was outbound north of Scotland. Oblt.z.S. Schäffer decided to sail to Argentina rather than surrender. During later interrogation, Schäffer said his main reason was a German propaganda broadcast by Goebbels, which claimed that the Allies' Morgenthau Plan would turn Germany into a "goat pasture” and that all German men would be "enslaved and sterilized". Other factors were remembrances of the poor conditions and long delays that German POWs suffered through, in being repatriated at the end of World War I (see Forced labor of Germans after World War II), and the hope of better living conditions in Argentina, which had a large German community. Schäffer offered the married crewmen the option of going ashore in Europe. Sixteen chose to do so and were landed from dinghies on Holsnøy Island near Bergen on 10 May. 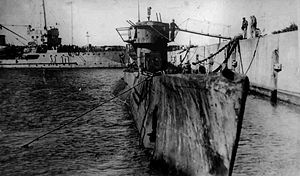 U-977 then sailed to Argentina. Schäffer's version of the voyage states that from 10 May to 14 July 1945 she made a continuous submerged Schnorchel passage, "at 66 days the second longest in the war (after U-978's 68 days)". A conflicting account from the U.S. Navy (USN) report of 19 September 1945 contradicts Schäffer's version. According to the Navy report, the submarine stopped in the Cape Verde Islands for a short break, then completed the trip traveling on the surface using one engine. Crossing the equator on 23 July, she arrived in Mar del Plata, Argentina on 17 August after 99 days at sea from Bergen and a voyage of 7,644 nmi (14,157 km; 8,797 mi). Schäffer maintained that he crossed the Equator on 23 or 24 July 1945, on this both the US Navy and Schäffer agree. 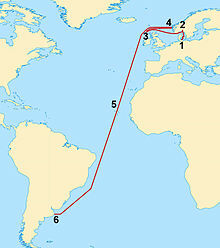 The Schäffer version of the trip said that after they stopped in Cape Verde for a short break, they completed the rest of the trip alternating passages in the surface, partly dipped, arriving in Mar del Plata, Argentina, on August 17, after 99 days at sea from Bergen on a journey of 7,644 nautical miles (14,157 km; 8,797 mi). After surrendering to the Argentine authorities, as had happened to the crew of U-530, they were extradited to the US where they responded to the charge of having torpedoed the cruiser Bahia, and then to the UK, where they faced accusations that they had landed Nazi leaders in Argentina before surrendering. Schaeffer was released in 1947. U-977 like U-530 was seized by the US Navy, and sunk during naval firing exercises, in its case in 1946, when it was used as a target. Schäffer later wrote a book: U-977 – 66 Tage unter Wasser ("U-977 – 66 Days Under Water"), the first postwar memoir by a former U-boat officer. It was published in 1952, and was translated into English under the title U-boat 977. Documentary film U-977 - 66 Days Under Water directed by Nadine Poulain, Schäffer's granddaughter, which was in the final stages of production in 2014. ^ Salinas & De Nápoli , 2002. ^ Paterson, 2009. Pages 27 to 33. ^ Office of Naval Intelligence (19 September 1945). "Report on the Interrogation of Prisoners from U-977 (File Op-16-2)". U.S. Navy. Archived from the original on 29 March 2009. Retrieved 21 August 2009. ^ Kittel & Graf, 2015. p.93. Schäffer, Heinz (2006). El Secreto del U-977. Buenos Aires: Editorial Hisma. ISBN 987-22996-0-9. Time Magazine 23 Feb. 1953 Book review "Go In & Sink"
Helgason, Guðmundur. "The Type VIIC boat U-977". German U-boats of WWII - uboat.net. Retrieved 29 December 2014. Hofmann, Markus. "U 977". Deutsche U-Boote 1935-1945 - u-boot-archiv.de (in German). Retrieved 29 December 2014.